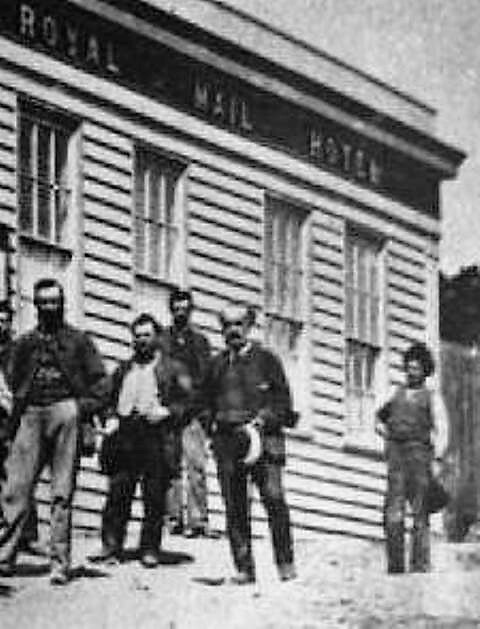 The History of the Royal Mail Hotel compiled by Margot Hitchcock, Historian for the Blackwood & District Historical Society. 2014. The Royal Mail Hotel was first recorded as a Hotel 1863 and it was noted as a Stage Coach Office for Cobb and Co in 1863 in the “Victorian Gazetteer”. The Hotel was located on Allot. 21 Sec. 2 on the corner of Peter and Alberts Streets, Golden Point, Blackwood. James Millyard was the first known Hotel Keeper. The Hotel was nearly destroyed by fire in 1878 when most of the shingle roof was burnt. The next recorded owner was Colin McLennan in 1879 until 1889. Frederick Cotton was owner from 1890 until1893. Mrs. Mary Linnehan was Hotel Keeper until 1899 when it was bought by William Byres (2nd). The Byres family owned and operated the Royal Mail Hotel, which was also a stage coach office in the early days. 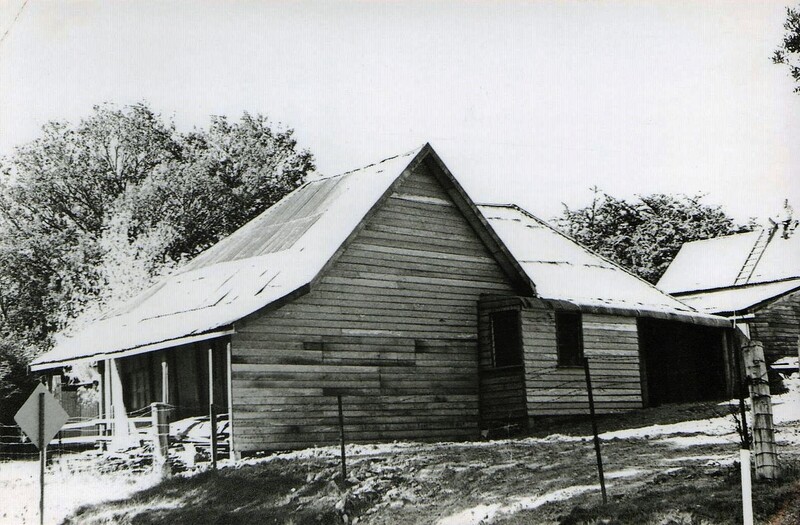 The Byres family had arrived in Australia in 1857 and were first recorded as having a house with sod walls and a calico roof and had a store. Mr. Byres had the hotel until his death in July 1913, and it was relicensed on December 31, 1913. From then on it was run by his wife, Annie Byres and her daughters as a Guest House where they took in guests and was classed as a Temperance Hotel until 1924. 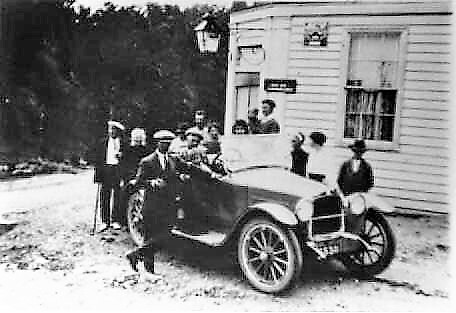 Royal Mail Temperance Hotel and Guest House, Golden Point, Blackwood with a guest load of visitors in an early model car. C. 1920. (Courtesy of the late Ernie Terrill.) ©. The girls were all excellent cooks and the Royal Mail was a popular place for people to come and stay. The Byres family received 175 pounds compensation for the cancellation of the Hotel license. 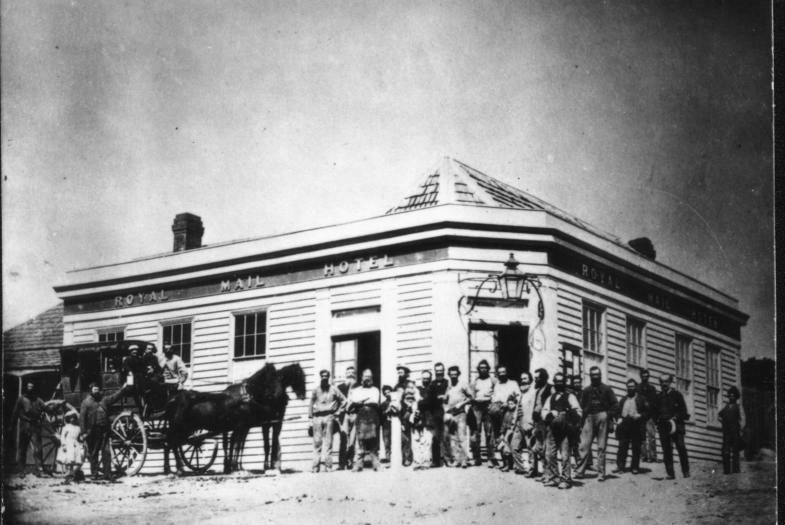 The Byres family also ran the Post Office next to the Hotel. 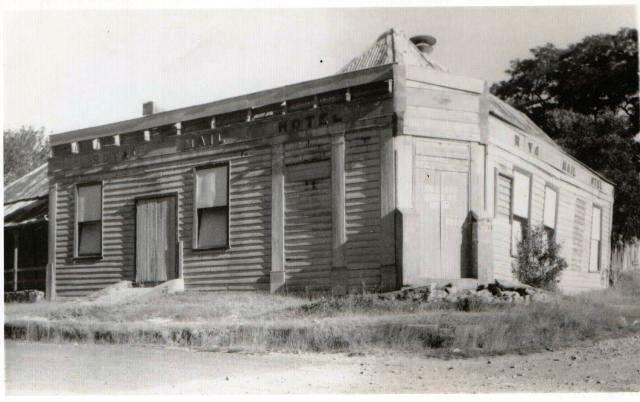 Mrs Byres ran the Store and Post Office up until the day before her death May 1910. Then it was taken over by other members of the family. 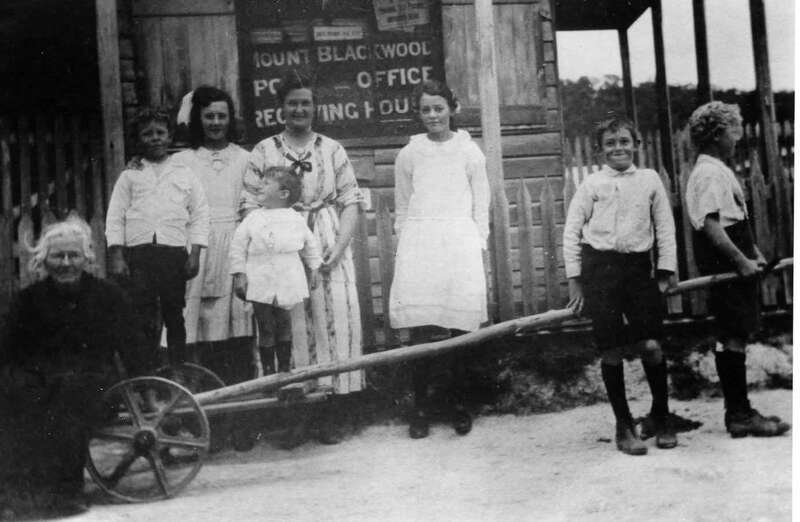 Grandma Annie Byres and family outside the Mount Blackwood Post Office and Receiving House, Golden Point, Blackwood. 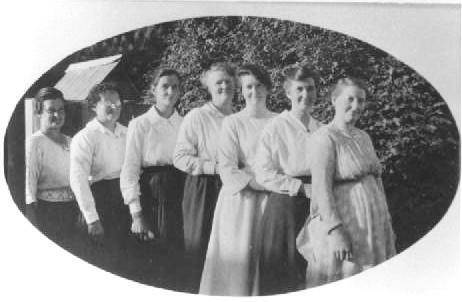 Back – Paul Taylor, Auntie Eck, Auntie Ina, Rene Budge, child – Heather Matheson. Boys – Clem and Gordon Turner. Post Card dated April 20th 1922. (Courtesy the late Rene Budge.) © B.D.H.S. and Margot Hitchcock. There were two Annie Byres – Annie Byres (nee Pryn) who married William Byres and Annie Maud Byres who married George Matheson. Annie Maud Byres was a little energetic lady and would never go our without wearing a hat. She always chewed cloves which she fascinatingly rolled around between her teeth. Grandma Byres would always walk to the church services at All Saints Church of England in Blackwood. One fateful day in September 1931, having visitors staying at the Royal Mail, Annie Maud Byres was up early preparing for the day. While cleaning around the fire place, her long skirt caught fire, probably being made more flammable by her rubbing methylated spirits on her legs each day as a remedy used for the relief of arthritis. On running outside towards the well for water to quench the fire, her calls for help were heard by the Stobie family who were staying there at the time. Receiving terrible burns, a call was made to the doctor from the only phone in town, which was at the Post Office in Blackwood. 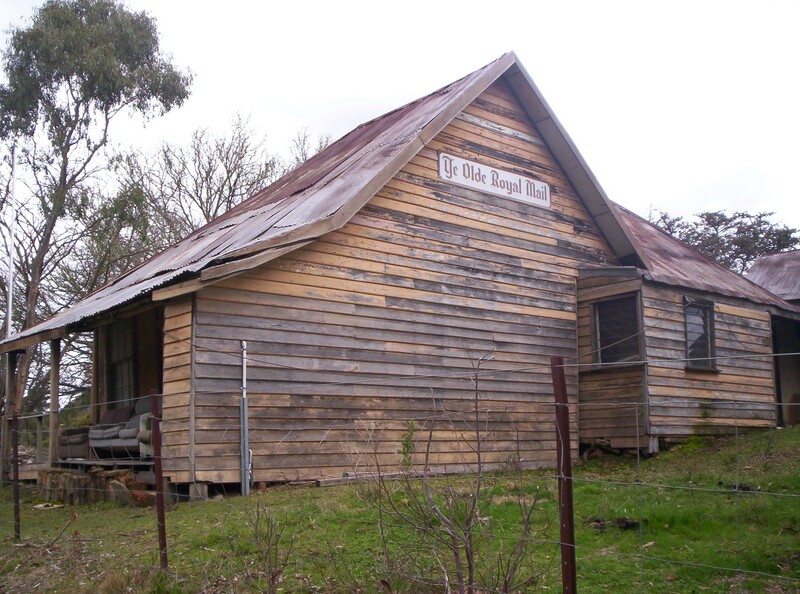 Doctor Gibb had to drive from Kyneton hospital, where she was taken but she died from her injuries on the 9th September 1931 age 71 years. 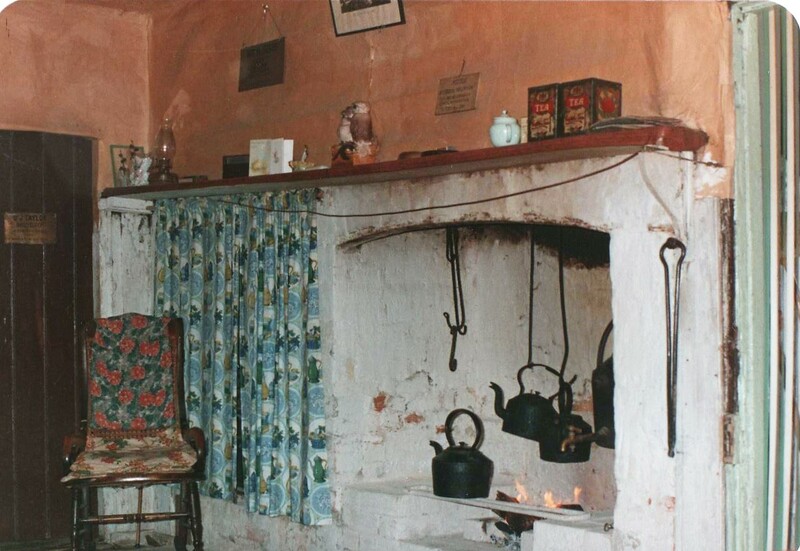 Fire place in house next to Royal Mail where Annie Byres got burnt, courtesy of Margot Hitchcock 1981 ©. The next owner of the Hotel was Ethel Turner, one of the daughters of William and Annie Byres. 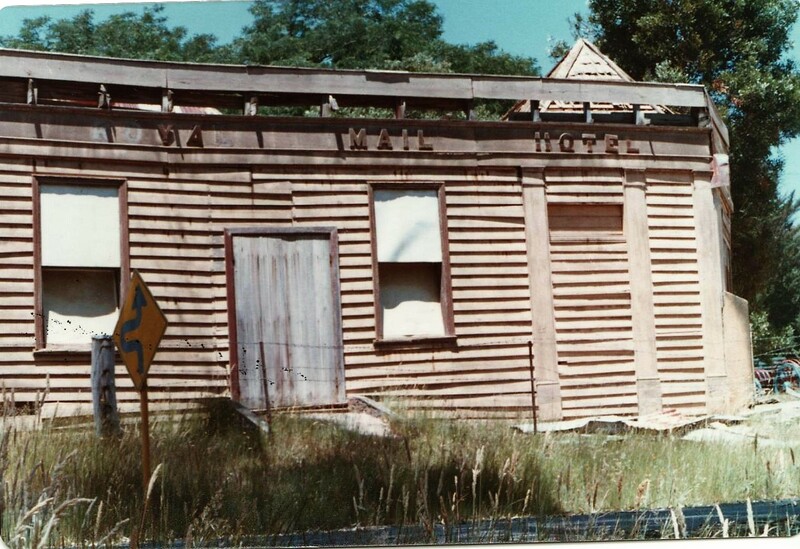 The Hotel was then no longer ran as a guest house but used by the family as a residence. During the mid 1930’s work was started to pull down the bar and some of the interior walls and it was suggested while doing thus that the rooms be used for dances. So the families energies went to making the place into a suitable dance hall. It was about this time that the Hotel’s billiard table was sold to the Kyneton R.S.L. This table having been used by tournaments including the billiard player Walter Lindrum who was a guest at the time. 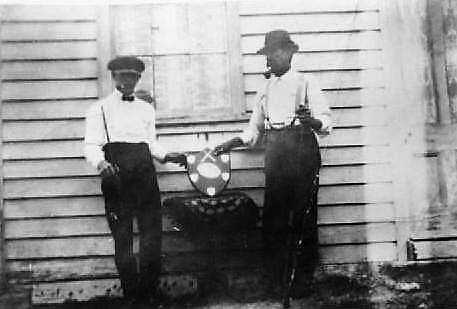 Billiard Shield with winners Ted Turner and George Matheson outside Royal Mail Hotel. C. 1924 (Courtesy the late Renee Budge.) ©. Once more the Hotel was brought to life with what became known as the Royal Mail Social Club where public dances were run by the children of Ethel Turner. Most of the organising was done by Ted and Gordon Turner with music on the piano supplied by their sister Renee. Mrs Ethel Turner organised and cooked all the delicious suppers including sausage rolls on a wood stove. The lighting was organised by Gordon Turner with an elaborate system run off a generating plant with a sound system of speakers connected to a record player for dancing when they did not have a band. Dances enjoyed were the Lancers, Evening Three Step, Pride of Erin, Quadrille’s and dances of the 1930’s era. Many a couple met at these dances and later married in Blackwood. These dances continued until the outbreak of the 2nd World War when the four Turner sons joined the forces. A few dances were held after the war in 1946 but with young families coming on these soon ceased and the hotel reverted back to being used as a private residence, until it slowly declined with age until 1980 when drastic steps were made to have the old hotel pulled down. The then owners of the hotel were the sons and daughter of Ethel Turner, Ted, Lyndon, Renee, Clem and Gordon Budge whose family had owned the Hotel for 82 yrs since 1899. 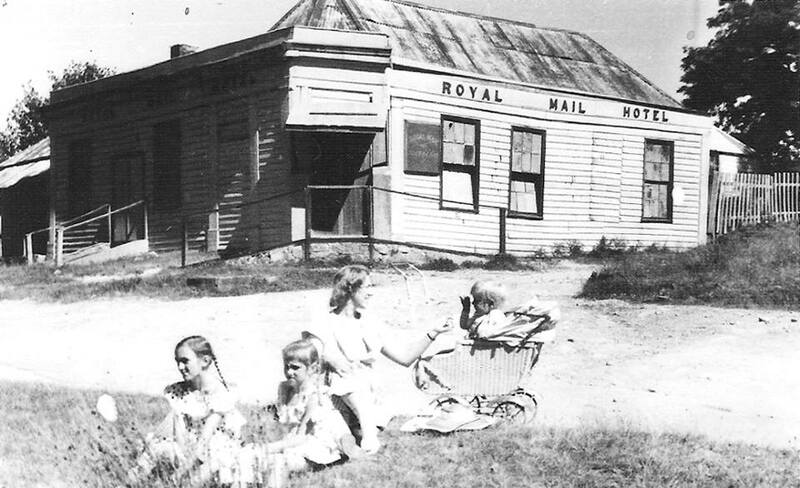 Photo sent to me by Simon Brown of himself in the pram with his mother and two sisters outside the royal Mail Hotel in 1950. (Courtesy of Simon Brown) ©. 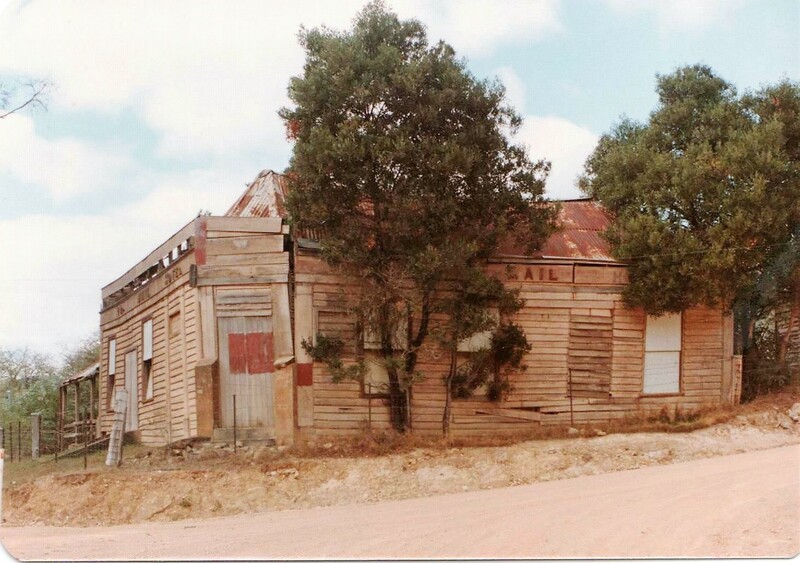 Front of the Royal Mail Hotel 1975 (courtesy of Margot Hitchcock) ©. 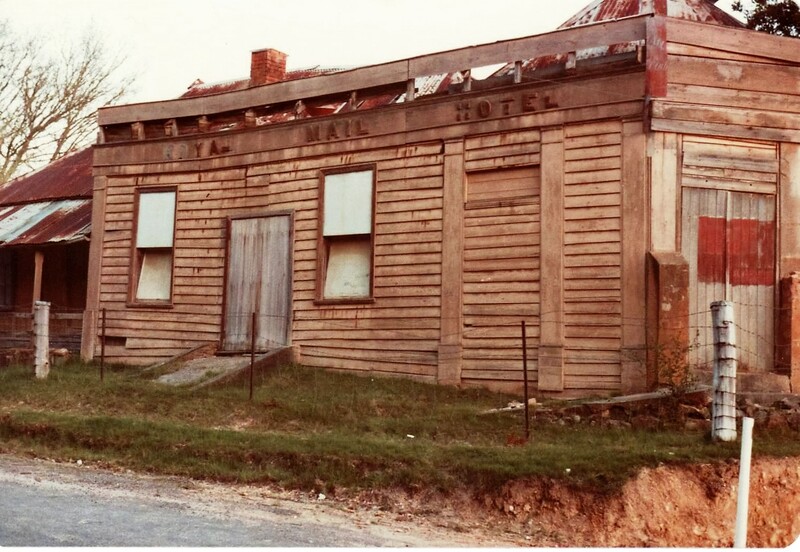 In 1980 the local Ballan Shire Council placed a ‘Demolition Order’ on the Royal Mail Hotel, which ordered them to either restore or barricade the two outside walls in such a way as to make them safe, as there was a possibility that they would fall onto the roadway. Failing this the only other alternative was to demolish the two outside walls that were a danger. 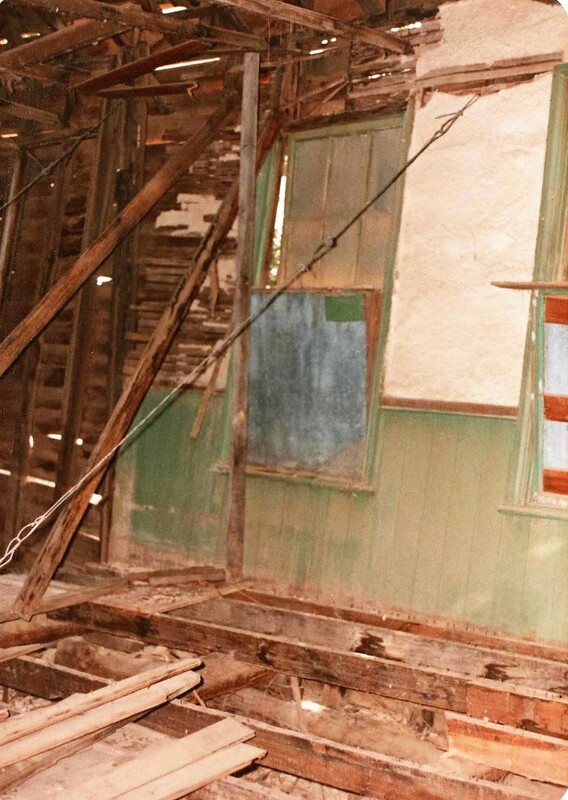 The Turner family had a working bee to try to restrain the two outer walls by pulling them back into position by restraining wires inside but this did not have the desired effect due to rotting timbers. Interior of the Royal Mail Hotel 1981 before demolition with the re-straining wires . Courtesy Margot Hitchcock ©. The Blackwood Historical Society members met with Gordon Turner to see how they could help and were shown around to inspect the deteriorating building, but it was agreed that the building was too far gone to render any work being done to restore it to its original condition. 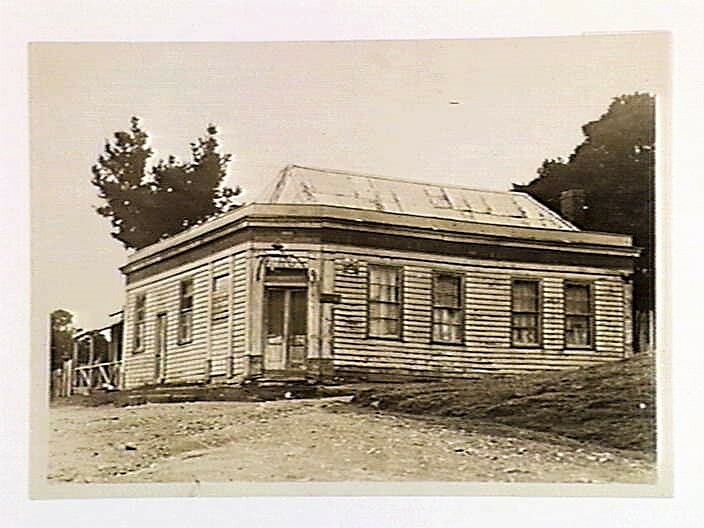 Photographs were taken by Margot Hitchcock inside and out as a historical record and the owners all agreed that they had no alternative than to arrange a demolition of the building to comply with the council’s order. 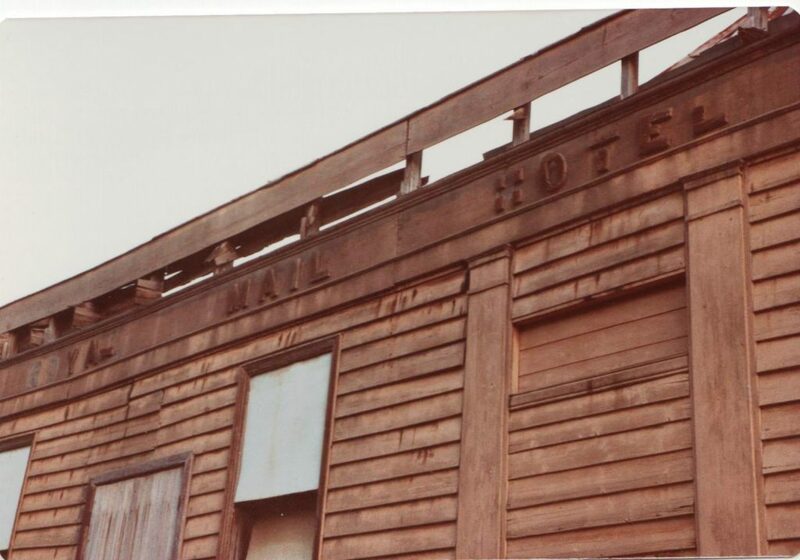 The Royal Mail Hotel 1982 being demolished, re-using old weatherboards to clad remaining wall of residence. Courtesy Margot Hitchcock ©. Builder working on the roof of the Residence of what was left after the Royal Mail Hotel was demolished. 1982. Courtesy Margot Hitchcock ©. 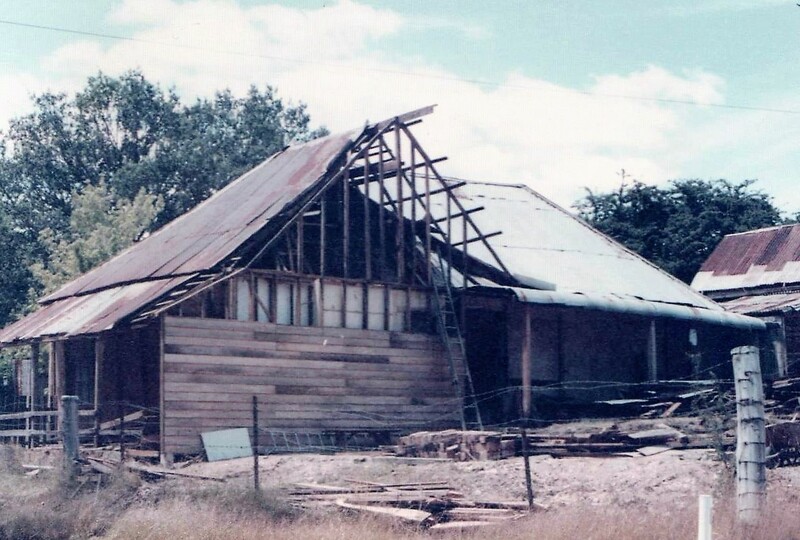 In December 1981 the demolition of the old Royal Mail Hotel commenced of which Margot Hitchcock attended to record with photographs the various stages of demolition until the completion in January 1982. After the old iron was taken off the roof, the original shingles on the roof were revealed as seen from the street. The Historical Society were offered the original boards from the top of the wall with the old name ‘Royal Mail Hotel’ on it and they were taken to the Historical Society’s Museum where they are now on display. The back part of the residence of the Hotel was kept by the family as it was still liveable. The side wall of what is left of where the Royal Mail Hotel was showing the new sign ‘Ye Old Royal Mail’. Buildings side and back are what remains of the original residence. (Courtesy Margot Hitchcock) ©. 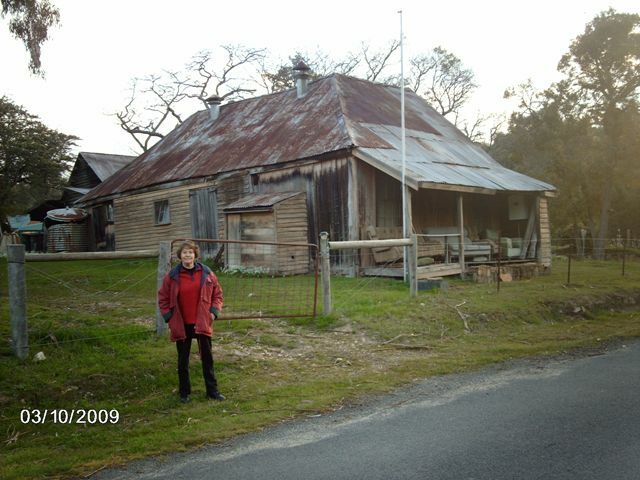 The building that stood next to the Royal Mail Hotel still stands today as shown with Margot Hitchcock out front 2009. Courtesy Margot Hitchcock ©. Information courtesy of Frances Dillon nee Matheson, Gordon Turner, Renee Budge, ‘Hotel & Hotelkeepers of Blackwood’ by Andrew Robertson, and ‘Aspects of Early Blackwood’ by Allan Buckingham and Margot Hitchcock.